Are you in the market for custom forged steel doors? 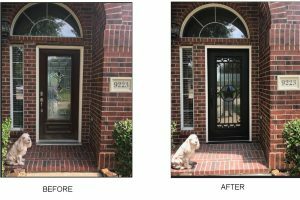 Southern Front Doors can meet all of your dooring needs! Custom forged steel is a specialty that not many manufacturers offer. Most only offer industrial standards, but we want you to have the best of the best. Southern Front does steel, fiberglass, iron, and wood doors. We have everything you could possibly need between our customs and our extensive online inventory. We ship around the United States and offer professional installation to our Houston clients. 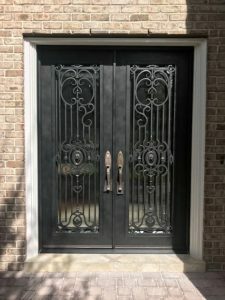 Let’s talk about our forged steel doors, our custom dooring options, and how you can get a beautiful door installed by us in your home. Would you like custom steel doors? Forged steel has a modern feel that most other materials lack. It is dark like iron, clean like fiberglass, and thicker than wood. Therefore, it would make an ideal door if you want each of these qualities in your door. This door will be easy to clean, durable and strong, and beautiful on top of it all. We, personally, also appreciate the castle-era mood we get from it. There’s something about this door that says, I am formidable! If you are looking for a door that will make you feel safe, this is the one for you to invest in. Furthermore, if you are buying doors for a commercial setting, steel doors are perfect. They will offer security, sleekness, and functionality. Steel is also much more lightweight than iron. Steel is the combination of iron and carbon and therefore, lighter and more flexible. 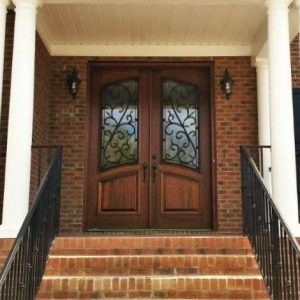 We offer more than just custom forged steel doors at Southern Front Doors. Not only do we have amazing custom options, but an extensive online inventory as well. However, we would like to focus on our custom doors. In terms of wood doors, we offer Andean Walnut, Mahogany, and Knotty Alder as materials. All of these are the best of the best in terms of wooden doors. Furthermore, we also create lovely glass paneling. If you want something more modern, we can do fiberglass doors. If you like something that has a classic look, ironwork would make a beautiful addition. Our forged steel doors are the best in Houston. Southern Front Doors has been serving the Houston area since 1996. We are committed to quality, fortitude, and longevity. We know that these are all the qualities you require in your front doors. At Southern Front, we believe that you deserve the best. We also believe that we are the best. To speak with a representative, you can call (281) 890-5860 or visit our contact page. Our contact page is located at this link. You can also buy from our extensive online inventory, which is always here. In terms of forged steel doors, we can give you the quality no one else can. If you come to Southern Front Doors, we will ensure that you are leaving fully satisfied. Contact us about your custom forged steel doors today so that we can get you fitted as soon as possible!